2200 Miles » Happy Anniversary! 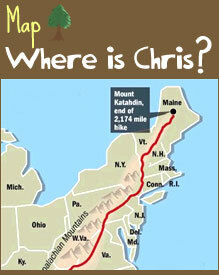 One year ago today a young man who didn’t yet know his name was Feed Bag set foot on a trail in Georgia that would ultimately lead him north 2,200 miles into the state of Maine. One year ago today this Feed Bag weighed his 55lb pack at the visitor center in Amicalola State Park early in the morning before trekking up Springer Mountain. One year ago today Feed Bag began his first overnight backpacking trip. One year ago today…I was a hiker. Fast-forward 365 days until now and I find myself still trying to process what I went through during those 161 days on the trail; what it meant; what I accomplished; what I learned; how I changed. Looking back I see that there were as many negative results of my hike as their were positive. Would I do it again? Well, probably, but there are major things I would do differently. First, I wish I had taken someone with me. I loved the people I met while hiking; I’m still in contact with several. However, I function better on a team and wish I could have had someone out there with me to share the entire experience, day in and day out. I sensed I was trying to attach myself to several hikers towards the end just so that I would have some familiarity and companionship. I’m especially thankful for a certain few who put up with my whining from New Hampshire to Maine! Second, I wish I had planned ahead and thought through the financial implications of the hike. To truly enjoy the experience it’s best that you not be worried about money in the bank. It’s important to spend wisely and remain responsible while hiking, even thinking ahead to work after the trail. When planning the hike I thought I would be able to afford it all up front. However I got into tax trouble early in 2009 upon learning that I hadn’t saved enough to pay my taxes AND afford the hike; rather I owed four times what I had already paid in estimated payments. So I spent a week or so trying to determine if I should scrap the hike and try again another year, or go into debt and attempt the trail. Obviously I chose the latter, and I’m literally paying for it now. However, I am glad that I shared the experience as it happened through the medium of this blog and I’m incredibly happy that 18 people were inspired enough to sponsor a child. While short of my ultimate goal of 2,200 (yes, I knew it was far-fetched) we say that “one” makes a difference. And now that’s 18 lives that won’t be the same! Knowing you were reading and that you cared is honestly part of the reason I was able to finish. If you’re still interested in sponsoring a child there is still a great need. For $35 a month you will be making a large difference in someone’s life. I also enjoyed receiving a few questions from my blog readers on how to prepare for their thru-hike! Happy to help! Onto some practical matters…the cost of hiking. It should be said or remembered that I started from scratch when beginning this trek. I had no camping gear, no hiking gear, and very few trail-appropriate articles of clothing. It should also be noted that you end up buying much more gear while hiking; socks wear out, gaiters break, you lose your bug net, you switch to light-weight gear for the summer months, you need two new filters for your water pump, more fuel, new batteries for the headlamp and MP3 player, and shoes…oh, how the cost of shoes adds up! And before we get to the numbers, I’ll confess that I am not necessarily a thrifty or frugal person. Many people could have avoided some of the hotels, hostels and restaurants I patronized in order to make my journey more comfortable. However, it’s all part of the experience, so without further ado here is the approximate costs involved in my trip. Lastly, I want to post a video reviewing the gear I used during the summer months of the trail. It’s great to shed several pounds of weight when the weather warms up and you no longer need as much gear. Yes, this video was filmed A LONG time ago. However, the information remains relevant. But before we depart, thanks again for being a reader. The next time you hear from me will either be a.) to announce my next adventure and invite you along or b.) to talk about how you can see “The Road Less Traveled,” the documentary I was filming for. The producer has had some unfortunate setbacks with equipment and editing, but one of these days I’m hoping to make it available to you! Dude we have the same backpack. Looking forward to seeing you when you are up this way! happy anniversary. I have to say that I miss the blog posts. Maybe you could start a new blog from the road?